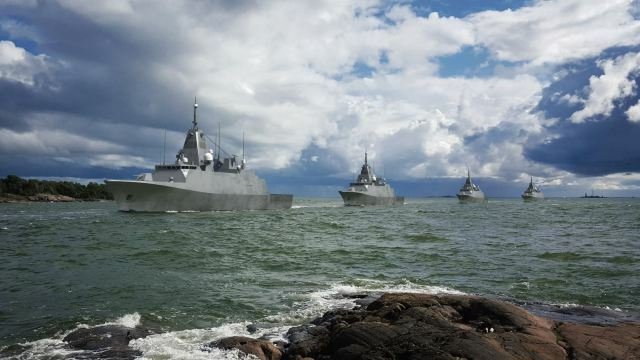 According to Corporal Frisk, the Finnish Navy has released further details on the upcoming corvettes. To begin with, RMC of Rauma has signed a letter of intent with the Finnish Defence Forces for the construction of the vessels. This has been expected, as of the three shipyards in the country capable of producing ships of this size, Artech Helsinki is Russian-owned and Meyer Turku has filled their production capacity for the foreseeable future. RMC has also teamed up with Patria to ensure that the newly-founded company has the economic and logistical muscle behind them to manage a project of this size. This might be crucial, as if RMC would fail the reviews currently being undertaken, there exists a very real risk that the vessels will have to be built abroad. A special arrangement is that the Finnish Defence Forces remains responsible for the design work, with the yard handling only the building process. This is to make possible the fast delivery schedule. An interesting article in this year’s edition of Finnish Defence Force’s Insinööriupseri, a publication published yearly by the Engineer Officers’ Association (engineer as in «practitioner of engineering», not sappers/pioneers). This includes not only articles on the subject, but also new renders and pictures from the research program. Unlike the earlier renders, the concept is shown only from the sea level, meaning that several of the details that could be made out from the earlier bird’s eye views are not visible. Still, a number of important changes can be made out. The most obvious one is that the single-panel rotating radar of the earlier renders have been replaced by a multi-panel fixed installation on a large mast of a truncated pyramid shape. This would mark a significant step up in detection capability and response time, as well as offering better stealth characteristics. Notably, the TRS-4D, successor to the TRS-3D currently found on the Hamina- and Hämeenmaa-classes, is available in both configurations. 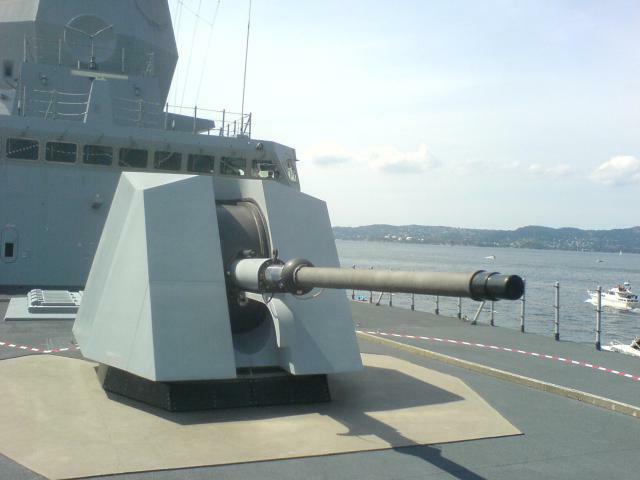 The only weapon system visible is the fore-mounted gun, which is reminiscent of the BAE 5” (127-mm) Mk-45 Mod 4 turret. If so, this would be the smallest class to be equipped with this weapon, and while not impossible, more likely the turret in the picture is just a generic placeholder, with a 3” (76-mm) weapon being the likely choice. The general design has also received a more pronounced twin mast setup, with the front mast holding the four-panel radar and sporting what seems to be an ESM-antenna on top. The rear masts holds an additional array of different antennas, and probably shrouds the funnel to reduce the IR-signature. This is a setup suspiciously similar to that employed by TKMS in recent MEKO-designs, including on the upcoming German F125-frigates and the failed MEKO-D bid to Australia. This is not to say that TKMS necessarily is involved in the design, the basic principle of splitting up prioritised systems for greater redundancy by physically separating them is common sense and not uniquely German. 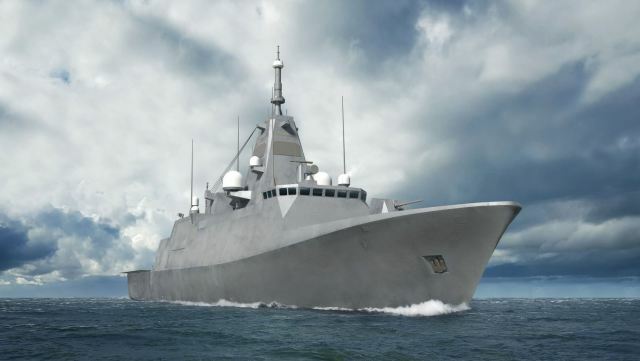 However, TKMS would be a logical partner for the «international cooperation and technology sharing that has occupied an important role in the project», and the truncated front mast does bear a strong resemblance of the designs used for an early F125 draft and the aforementioned Australian concept. For the F125 concept, note not only the truncated pyramid form, but also the ESM-antenna on top of it, and wire antennas stretching from the front to the rear mast. It is also mentioned that the U.S. Navy has been the single most important partner up to this point, and that this is a natural continuation of a collaboration that has been taking place for close to ten years already. The hull shape seems more or less finished, with tank testing having been performed in 1:15 scale, both as towed and self-propelled model. The propulsion will be of a traditional kind, with two shaft lines sporting a single propeller each. The propellers are a minor project on their own, and are set to be of a highly advanced design. This is due to the somewhat conflicting demands of high top-speed, small diameter (due to overall draught requirement), and low noise (and high cavitation margin). All this, while at the same time being strong enough to cope with ice. This creates significant metallurgic and hydrodynamic challenges, but high-level propeller design is also an area of expertise found both in Finland and amongst our close friends abroad (including Sweden). Suffice to say, this isn’t on my top-five lists of things to be worried about in the program.